“Going Grandad House” Ahmed said to me the next morning so that was how I found myself in a Fiat Doblo with ten other people and a pygmy goat. We all excitedly crammed into the car, men, women and children for the two-hour journey to the remote village of Karatut to see Ahmed’s grandad. I sat alongside Ahmed in the front with two of the smaller children squeezed in next to me. Several bags of food together with some pots and pans were also packed in. As I’d already named the goat, Junie Little Legs (after my Mum), I was delighted to learn that fortunately, she wasn’t going to be on the menu anytime soon. Thirty minutes into the journey and fruit and bread was being handed round to all passengers as the family happily chattered away to each other in rapid Turkish. Most vehicles travelling that day were all as overloaded as we were and the few Turkish policemen whom we passed seemed either unfazed or full of holiday spirit. An hour later and we had a toilet break at a village petrol station and I was horrified to discover that the public toilets were the squatty potty variety. Now as I’m no contortionist and no Olympic gymnast either, I knew that in skinny jeans these facilities were going to be an issue for me. Returning the car, I explained to Ahmed “no nice toilet” so he and his elder brother kindly walked me around the village, asking at every shop and hotel, whether they had a suitable toilet. Fortunately, three gentlemen sat outside a hotel, playing cards, took pity on me and allowed me to use their facilities. They gave me a room key and Ahmed escorted me upstairs. I was surprised that the hotel was little more than a hostel but charmed that they had provided slippers outside each room for every guest to use. I was touched by their kindness and trusting manner and thought that there wouldn’t be many hoteliers back in the UK, that would hand over a room key to a complete stranger without any financial gain. When I returned to the car, it was to rousing cheers and applause. At this point my face must have resembled the same colour as my fuchsia fleece. So I felt compelled to execute a bow to my appreciative audience. Although, I secretly hoped that Grandad’s house wasn’t that much further and also made a mental note to watch my liquid intake, as I might not find the next lot of facilities quite as convenient! I’m particular about where I use the restroom, too. Fun read…relatable. I’ve always been a bit fussy but I think that’s because my mum has always been that way and whilst I try not to be a princess about the Turkish toilet thing, I just can’t do it! “squatty potty” is probably a bit sophisticated for the shower tray and garden hose that is the Turkish toilet! Glad I make you laugh! I loved the description of “squatty potty,” too! I practice a certain yoga position just to keep me in shape for squatty potties. Yes, they are grim! I would have done the SAME thing – a gal can’t peel off skinnies for squatting purposes. And I love the pygmy goat’s name. great story and lovely memories. Sometimes there just isn’t a toilet handy, especially when you’re hiking. A little privacy and I’ll gladly christen a patch of forest, or, more recently, a bunch of rocks behind a boulder on Kauai’s north shore. It helps if you have a few tissues or a napkin tucked away in a pocket. Jennifer, you must have been a girl guide – Be Prepared! No girl guiding for me, I’m afraid. Just experience. And necessity. At my age, when you gotta go….. Which reminds me…time to practice squats. That’s given me the biggest laugh today! You are a funny funny chicka! I can’t wait to read the previous and future posts about your exciting life in a faraway place. Wow, I don’t know where to begin! IGWS I LOVE your background, duh, right? Enchanted Seashells better love shells! Are there lots of them there on the beaches? I went to Greece once and could see Turkey from Rhodes but I was told it was big for white slavery and I shouldn’t visit (that was back when I was young and cute) Cheers! Hello my lovely! You can get to Turkey quite easily by boat from the Greek island of Kos – you must go! We used to catch the boat from Altinkum habour to Kos as they sold bacon, english butter and cheese on the island so we used to stock up on groceries! I’ve put the whole sorry episode of my public humiliation under honeymoon stories if you want to see how it all started – nice to have you along and I loved the title of your post! I have trouble with squatting. I’m sure if you’ve done it all your life it must strengthen the muscles in your legs or something, ‘cuz I see women far older than me managing, but I always worry how I’m gonna get up afterwards, without a handle to pull myself up with. I still don’t know how to do it in jeans without taking the damn things off. The number of times I’ve peed over the back of my trousers. That’s exactly why I can’t do it – couldn’t sit in the car all day smelling of pee – there’s enough time for that when I’m old and grey! I’ve not been to Turkey, but have used the turkish-style toilet in several countries. As long as you keep your balance, it seems quite sanitary since your body isn’t touching anything – and the squats really do strengthen. Growing up on a farm and years of trail running and marathons have taught me to use whatever is available – and always keep a couple of tissues and sealed handiwipes tucked somewhere. Love your adventures – some things in life we just can’t make up if we tried. I had a squatty potty experience in the coach station outside Pamukkale – I don’t think I’ll ever master those things. I thought the hose was there to wash off your feet afterwards!!! Lucky I was wearing flip-flops…. what a fabulous idea and very appropriate! I’m in awe of our trouser wearing Turkish sisters that manage – they’re certainly a lot more bendy than me! Just been looking over all your Cappadocia again, think I might have to print them off and put them on my fridge as an incentive! You named the goat after your mom? She must be so proud. I haven’t told her yet! You might want to keep that a secret. Clearly, I need to be researching Yoga classes; just in case!!!! I don’t know about being brave, I was almost hyperventilating at the thought of being caught short again and like your in-laws, nothing is too private to be discussed by a Turkish family including urinary tract infections – bless ’em! Oh, the hole in the ground toilets? The kind that has the two “place holds” for the feet where you have to squat backwards? Unfortunately those are very common in France as well–usually as the public bathrooms in a town or sometimes at rest stops along the highway. 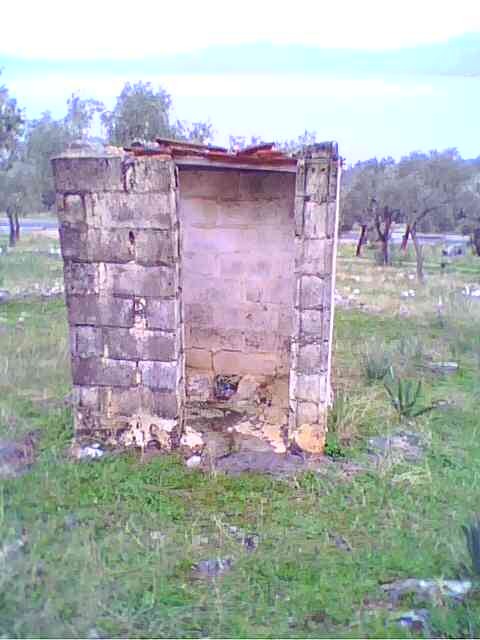 I kid you not, the French call those types of toilets “toilettes turques” or literally translated Turkish toilets! Admittedly, I feel a bit of a princess sometimes but I just can’t do it and with my knee injury, I might get down but I wouldn’t be getting up without the assistance of a hoist. Wow, you are a good sport, Dallas… I’m with Aisha on this one, everything would have come to a complete stop! I’m pleased to say that Devon has no squatty potties either – always a silver lining somewhere! There aren’t many and even in the grim godforsaken ones – the charge for them! How well I remember some of those and my tears that went with them. It strengthened certain muscles … I learned to hold it. Wonderful storytelling as always my friend. This has had me laughing all morning – I must remember to do those exercises next time I’m at the bus stop! I guess hiking your leg was out of the question? Fabulous idea but sadly not equipped for that one either! I’ve encountered those lovely ‘toiletless’ facilities on quite a few occasions, in Greece and even Paris, France. Most unpleasant. I can never understand why there are always pedestal toilets in the gents when the ladies get stuck with the shower tray thingy! The weirdest (and scariest) squat toilet I’ve ever used was on an overnight train in Thailand, where, through the hole, you could see the tracks whizzing by! GAWD! Oh I would have had to close my eyes and think of England! I’ll go anywhere, squatty potty, too. Guess that’s the outdoor girl in me. You have such great stories! Love it. I’d been in a constant state of worry – you can’t beat a nice ladies loo! I have invested in a GoGirl – a urinary device for women that allows you to pee standing up. It takes a bit of practice but as I cannot squat either it certainly takes the terror out of squatty potties, unless of course you need to do a no. 2! That would be a challenge even in a skirt rather than jeans! ah! i hated the squatty potties as well …. but often thought it must give turkish women amazing leg muscles! Turkish toilets are my undoing but most petrol stations now have at least a pedestal toilet in the gents which means Ahmed has to stand guard but its a lot more preferable than the alternative. You tell the best stories! And they’re true!! 🙂 Oh, I could never do a squatty potty. So glad the menfolk helped you out so nicely. I do so love a happy ending with a handsome hero or in this case heroes! And lots of deep controlled breathing ……………. or is that childbirth! I have navigated my fair share of turkish toilettes in France – merci beaucoup 🙂 – can’t believe they still exist!! Thanks for an amusing post. I’ve had holidays like those too!!! !